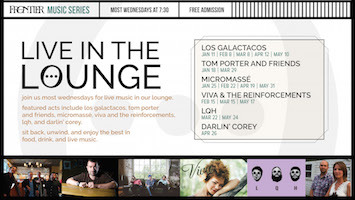 Join us most Wednesdays for live music in our lounge. Featured acts include Los Galactacos, Tom Porter and Friends, MicroMassé, Viva and the Reinforcements, LQH, and Darlin’ Corey. Sit back, unwind, and enjoy the best in food, drink and live music.